Pacific Gas and Electric Company (PG&E) is working with the Stanislaus National Forest (USFS) on upgrading Pinecrest Lake’s facilities and infrastructure to enhance recreation, meet Americans with Disability Act (ADA) accessibility needs and improve traffic and parking conditions. The planned improvements to Pinecrest Lake’s beaches, trails, bathrooms, campgrounds, parking lots and roads are designed to make your recreation experience more enjoyable and accessible. These upgrades will enhance access to Pinecrest Lake with better traffic circulation, parking, boat launch and dock facilities, fish cleaning station, trails and beach and swimming facilities. The expansion and modernization of public restrooms and the facilities for disabled visitors will improve barrier‐free access to recreation resources and create new recreation opportunities. Together, these measures will enrich the Pinecrest Lake recreation experience and help protect scenic and other natural resources. All facilities are designed to maintain the historic district of Pinecrest and will utilize sustainable principles to minimize water use and resource consumption through energy saving designs. Learn more about the exciting recreational improvement plans and timeline. Please note: To avoid the summertime high use season, construction is planned to start in 2012 after Labor Day weekend and end prior to Memorial Day weekends annually through 2019. Pinecrest Lake reservoir exists to safely generate clean, renewable electric power. The Strawberry Dam was built in 1914, enlarging Pinecrest Lake reservoir, and today is a component of the PG&E Spring Gap – Stanislaus Hydroelectric Project (PG&E Spring Gap- Stanislaus Project). Hydroelectric projects are regulated and licensed by the Federal Energy Regulatory Commission (FERC). In 2009, the FERC issued a new license to the PG&E Spring Gap Project after a lengthy public review process that began in 1999 with the organization of an advisory team called the Stanislaus Planning Action Team (SPLAT) Collaborative. The re-licensing process involved numerous studies, over 300 public and regulatory agency meetings and a public environmental review process. As part of the project’s license, FERC required PG&E to develop a Recreation Implementation Plan (RIP), Traffic/Circulation/Parking Plan (TCP), and Shoreline Management Plan (SMP). These plans provide the detail to the infrastructure and recreation improvements at Pinecrest Lake as well as operational changes to better manage conflicting uses at the lake. PG&E and the STF hope you, your family and friends continue to enjoy Pinecrest Lake year after year. We are confident that implementation of the recreation, parking, traffic, and circulation improvements as well as measures to promote harmony among unique recreation activities, will ensure Pinecrest Lake continues to be a special place to create wonderful, fun and lasting memories. Pacific Gas & Electric (PG&E) and the Stanislaus National Forest (STF) jointly manage Pinecrest Lake reservoir. PG&E is licensed and regulated by the Federal Energy Regulatory Commission (FERC) to operate the Pinecrest Lake reservoir as a component of the Spring Gap – Stanislaus Hydroelectric Project for the purpose of safely generating clean, renewable power. Pinecrest Lake’s campgrounds, resorts, commercial areas, beaches and cabins around the lake reside on public land within the Stanislaus National Forest. All recreation and commercial areas are permitted and managed by the STF. 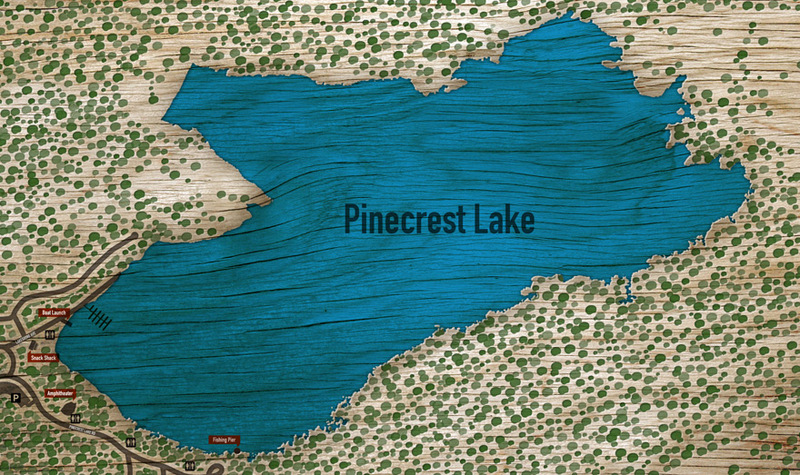 Looking to Visit Pinecrest Lake? Click here for information on camping, lodging and the marina. This website is intended to inform and update Pinecrest Lake visitors, cabin owners, area residents and businesses of upcoming improvements to Pinecrest Lake.